3 Days in Havana Itinerary | Travel? Yes Please! Havana is a lively capital city, full of charisma and, often times, crumbling charm. Friendly, colourful, and exuberant, Havana is worth a visit on any trip to Cuba. 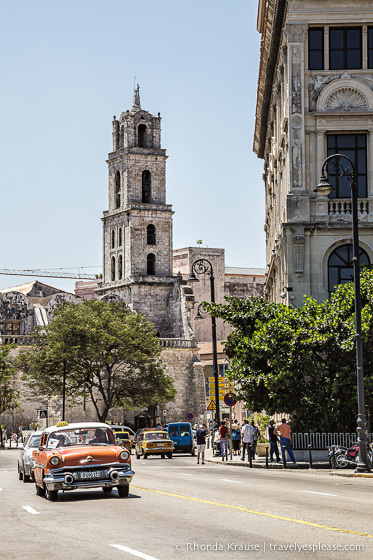 Days in Havana can be spent riding around in a 1950’s classic American car, admiring colonial architecture, visiting museums and wandering through the many historic plazas. Nights can be spent watching an extravagant cabaret show or hitting the dance floor at a salsa club. We spent three days in Havana (well, it was more like two and half) and found that was the perfect amount of time for us. We didn’t get to everything I wanted to because Havana wore us down faster than other cities we have visited. The heat and Havana street hustle unfortunately took its toll by the end of day two. Regardless of that, we still very much enjoyed Havana and all its spirit! Here is our guide for how to spend three days in Havana. On day one, we explored Old Havana (La Habana Vieja). This is the historic heart of the city and was declared a World Heritage Site by UNESCO in 1982. There are many plazas in Old Havana that are nicely restored, reviving the former splendor of this district and showcasing the colourful colonial architecture. The restored buildings house museums, galleries, shops, restaurants. 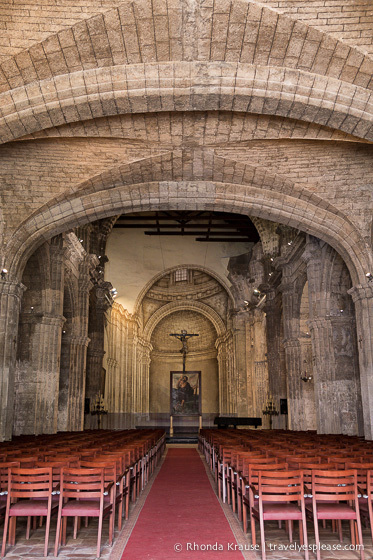 There are also some beautiful old churches worth visiting, including Catedral de San Cristóbal and Basilica Menor de San Francisco de Asis. We ended our first day in Havana by heading to the Miramar district to attend a cabaret show at the world famous Tropicana. Although the Tropicana is heavily geared towards tourists these days, it was still a fun night being entertained by cultural music and dance. On day two, we headed across the canal to explore some of Havana’s fortresses, also part of the World Heritage inscription. We first enjoyed a quiet visit to Fortaleza de San Carlos de la Cabaña, the largest colonial fortress in the Americas. Next, we walked next door and briefly visited the Castillo del Morro. From there, we had our cab take us to Central Havana (Centro Habana). We had lunch across from Parque Central then simply walked around, exploring the streets around the Capitolio. There was a lot of restoration work being done in the area, so we missed out on some places we wanted to visit. I would have liked to see the interior of the Capitolio, which was home to the government until 1959. Mike wanted to visit the Partagás cigar factory, Cuba’s largest, but it was also closed for restoration. After hanging out in Centro Habana, we set off to explore the Prado district. We walked down Paseo del Prado, the most picturesque boulevard in Havana. In the 19th century, the Paseo was used for military and carnival parades, but was widened and beautified in 1927. It now is lined with trees, benches and bronze lion statues, symbolizing Havana. Paseo del Prado ends at Castillo de San Salvador de la Punta, a modest fortification on the west bank of the entrance to the Bay of Havana. From there we walked back towards Old Havana, past the National Music Museum and a monument to General Máximo Gómez. On our last day, we took it easy and briefly explored the Vedado area. The area is a mix of unattractive 1950’s high-rises (many of them crumbling) and Neo-Classical mansions. There are not a lot of typical tourist attractions, but many of Havana’s main hotels are located here. Our first stop in the Vedado area was Plaza de la Revolución. This square is not particularly beautiful (it resembles a large parking lot) but is noteworthy because of its historical and symbolic importance. The Plaza was designed in 1952 under the Batista regime and was renamed from Plaza Cívica to Plaza de la Revolución after Fidel Castro’s victory in 1959. Since then, the square has seen mass rallies, military parades and official celebrations. The Ministry of the Interior prominently displays a huge bronze wire sculpture of Che Guevara, who had his office here in the early 1960s. Across the street from the Plaza is a memorial to José Martí, Cuba’s national hero. The memorial is a 109 metre tall tower, in the shape of a five-pointed star, with a huge statue of José Martí sitting at its base. We ended our time in Havana with a stroll along the Malecón. This seafront promenade is a popular gathering place for the locals, who come to enjoy romantic evening watching the sun set on the Bay of Havana. If we ever return to Havana, we’d like to visit the Museum of the Revolution and the Necrópolis de Colón, one of the largest cemeteries in the world and a national monument. I’d also really like to check out a salsa club & take a peek inside the Hotel Nacional. Even though many of Havana’s buildings are crumbling, you can still see many elegant details revealing their former splendor. If our interesting first night in Havana taught us anything, it was to expect some good stories to tell. Over the course of our three days in Havana, we experienced the city’s charisma, learned about its history, and got a glimpse into the complicated realities of life there. Even though our trip to Havana had some challenges, we still enjoyed our time there but ultimately were ready to move on to more relaxed destinations in Cuba. Please note that due to government regulations, US Citizens are forbidden from booking activities in Cuba. Purchases made through the included links earn us a small commission, at no extra cost to you, and help support this website. Thank you! For more information about visiting Cuba, read our First Time Visitor’s Guide- What to Expect on Your First Trip to Cuba. You may also enjoy our photo series, Colours of Cuba. Love the itinerary but I agree that you should see the Hotel Nacional and the Museo de la Revolucion if you get the chance to go back! I stayed at the Hotel Nacional and, though it was a little worse for wear, it was brilliant to stay in such a historical place. They also did a really interesting hotel tour covering the guests that had stayed there (the Mafia, Sinatra, etc.). The Museo de la Revolucion was fascinating because of the political climate – it was basically a giant propaganda exercise! Definitely worth a visit, though you had to take what you saw with a pinch of salt. I’m glad you had a chance to experience Hotel Nacional and the Museo de la Revolucion. They sound very interesting and I for sure will make a visit if I am ever back in Havana.